I’m standing by my assertion that we’re showing folks how to do credit spreads with zero risk. Today I’ve got a whole new one for you. In the last “Episode” of Anatomy of a RadioActive Profit Machine we saw how to ‘nest’ a Bear Call Spread within a Married Put position and take a substantial credit… without adding ANY risk. That is, we displayed an (August expiration) Married Put on Humana Resources… that had infinite upside potential… but only $940 AT RISK. Then, we opened an (April expiration) Bear Call Spread that took in a $100 credit, and by itself would have $400 AT RISK. Combining the two, you would think that $940 + $400 = $1340 AT RISK but in fact it reduced the whole risk picture to $840 AT RISK. “I’m often asked why I always capitalize the words, AT RISK. It goes back to what I learned in the 80’s about Walt Disney World employee policy. Woe, woe unto the Walt Disney Cast Member that referred to a “guest” in a written report without the capital G. It’s “Guest”, because the Guest was always the most important person in the park. Well, I think the most important thing to consider in any trade is absolutely, always, first and foremost and to the end… the amount that you have AT RISK. And there you have it… the reason I always capitalize that phrase. So ‘Nesting’ the near expiration Bear Call Spread that had $400 AT RISK within the Married Put trade that had $940 AT RISK reduces the risk of both. That’s how it works with a Bear Call Spread being ‘Nested’ within a Married Put. But there are other spread trades… that are done at a credit… that can be ‘Nested’ within a Married Put as well. Well, that seems mighty nice, to take in a credit on the front end. Know what’s even mighty nicer? I call this bad boy the “Money Net” because it’s possible now to capture even more premium. For example, let’s say that on Expiration Friday LULU is trading at $89. The two $90 calls expire worthless so there is no obligation to deliver… but the one $85 call is IN THE MONEY by four bucks..! Ummm, yeah. I don’t dig the UNlimited AT RISK amount in this whole idea. But, wait! Yes, I remember… we are “Nesting” this trade within another. The Ratio Call Spread here risking an infinite amount is something I would NEVER do even though I do have the trading clearance. But if I own the stock, then what? Heh… there’s no problem at all. Now, let’s count our blessings here. 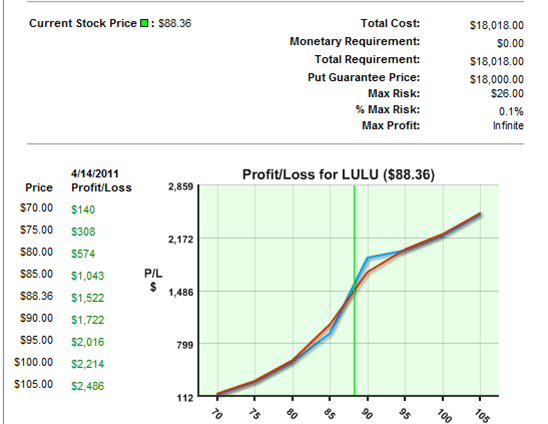 We’ve got 200 shares of LULU stock, insured by put options (June expiry, BTW). We have the ability to sell two April $90 Covered Calls against the stock, even with the lowest trading clearance. Oh, AND we can use the proceeds from that sale of TWO $90 calls to buy ONE $85 call… and still have a net credit. Viva la “Money Net”. Because if LULU crashes, mmmm… so what? We keep the .20 cents credit and we’re pretty much Bulletproof anyway. 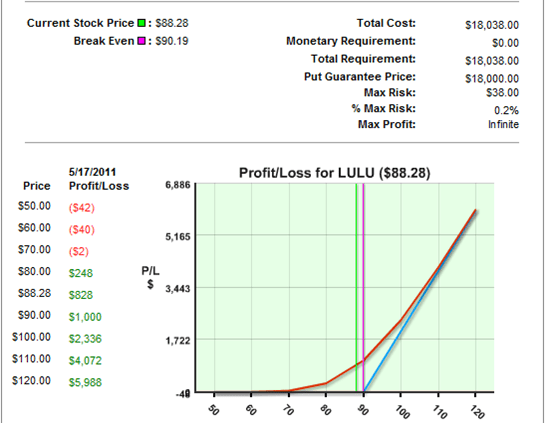 If LULU goes to $89 as I mentioned above… well, cool. The $4.20 credit I mentioned above applies and I STILL own the stock. But I know what you’re thinking… the Ratio Call Spread had INFINITE RISK as the stock kept going up! That’s no fun at all if you latch on to a fast moving stock! IN the case above, I opened a Ratio Call Spread (Buy one, sell TWO calls) at a small credit of .20 cents. The stock blew its doors and went above $93 a share. If I had done a “Plain Vanilla” Covered Call trade it would have cost me to hold on to the stock… but in fact I DID hold on to the stock… and got PAID a total of $1.70 to do so. Curious as to how? Thought so. Stay tuned. Ooooh, or better yet, come to the Webinar coming up and I’ll show you exactly how I was able to get paid… TWICE… to hold on to an explosively moving stock… while risking nothing at all. Wooo hooo! Getting interesting? ‘Like’ it or not, I’m going to keep posting! This ^ type of trade is one of twelve “Income Methods” that we use to reduce risk, take income, or both. They’re detailed in The Blueprint, available from PowerOptions two or three times a year. To get on the waiting list for the next release, and to get a free mini-course about low-risk, high potential trading, click here. For a free two-week subscription (no CC needed) to the PowerOptions “Search and Destroy” Platform for finding, managing, and BULLETPROOFING these kinds of trades, Register HERE. This is a great post series Kurt. I’m sure that most folks will agree that at first its rather difficult to get your head around all these income methods. Keep it up, I really like these step by progressions (with illustrations) as I can follow along pretty well now. Q: looking at the profit graph for the married put vs the married put plus the ratio spread at a stock price of say $90 and $100, we see that the profit from the combined positions is significantly higher than the married put, that’s because of the ratio spread, right? If so then it looks like there is a huge price range where the combined ratio spread is much more profitable. Is this so only after we bullet proof the stock, or can this be done from the getgo? The Ratio Call Spread can be applied any time that the long calls cost less than double the shorts. That said, I don’t want those shorts to be a lower strike than the put that is protecting the stock, nor do I want time to expiry be more than a couple months, usually six weeks. It CAN be done, as you say, from the get-go as long as those conditions are in place and the whole deal agrees with my personal CEGA: Conditions, Expectations, Goals, and Actions subject always to the Catastrophe Report: If the WORST POSSIBLE THING happens with the trade, will I be able to handle it? Good questions, Lyle. kepp ’em coming. Need more information in order to analzye. What is the stock price, put value and month? To me numbers are of more value than pictures. s $3.85 instead of the $2.90 that the $90s were selling for. As it turns out, things got even MORE awesome. But this isn’t the place for me to post… I’ll wait until later to spill it. Thanks for your comment. Happy Trading! Where’s the downside protection if LULU crashes? If U own the underlying @ $90; Ur losing below $89.80 after the net credit!? Sorry that wasn’t more clear. This Ratio Call SPread is being done in the context of a Married Put. Because of prior adjustments, the net cost basis for both the stock and the put were close to the strike price of the put… $90… and there is the downside protection. I’ll go back and re-read the way it’s presented. I’ve been talking a lot about “Bulletproofing” in recent posts so I guess I thought everyone was following along. I may reword things to make it more clear, but for now… it’s the $90 put options that are protecting the downside. 2. I buy the stock at a cheaper price than today. After I receive the stock I buy the married Put and create the Income methods as they develop. If you don’t like this strategy, please explain why? Well John, I don’t like the strategy because 1) I’ve been hurt by it, and because 2) it assumes that LULU will trade in a tight range… which it may not. 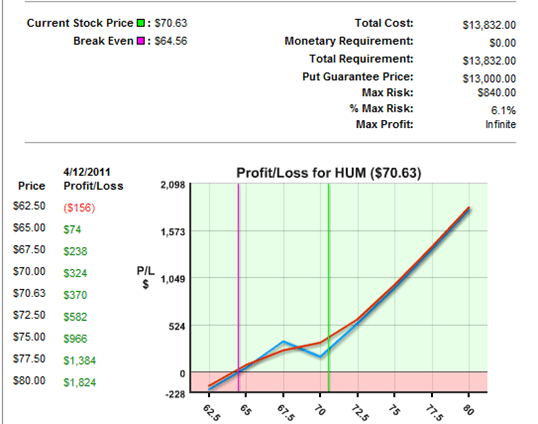 If I should sell a put at, say, the $125 strike… I will pick up $7.50 today (close of trading, July 11 2011). If LULU goes to $125 I keep the $7.50. Nice. If LULU goes to $120 I get it for ($125 – $7.50) = $117.50, even though it is trading at $120. Nice also. 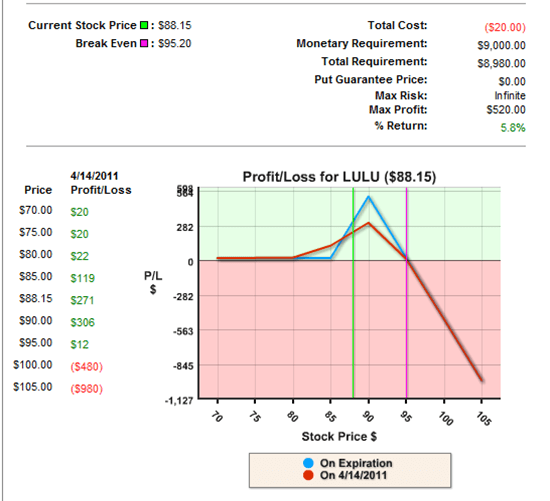 If LULU hits $100 a share I pay the same $117.50 for a stock worth only $100… really not so nice. Plus it could keep heading down. NOT something I want, especially when controllling losses while leaving the upside unlimited would be so easy. The “buy the stock at a discount by selling puts” idea only works when you are right about direction, and it can really smart when you’re not. Oh, and if the stock blows up from its current price of $117ish to $150… sure, I get to keep the $7.50 generated by selling a put. But wouldn’t it have been better to be long stock? Answer: YES. This is why Kurt always buys stock AND an insurance policy when he is bullish, rather than selling puts. If I’m wrong about direction, I may lose less. If I’m right, I may make more. Thanks for the Q, John! Now, if you’ve been assigned stock but its cost basis is lower count yourself lucky… ’cause it IS luck… but maybe start looking in to puts for insurance protection. Sometimes I don’t follow the early graphs because I don’t know what they are composed of. Would it be possible to indicate beneath each graph what puts, calls (long or short) produce the graph? It seems as though you are illustrating some graphs with just the puts and calls and then the next one is the result of “nesting” with the married put and underlying. Thanks a bunch. Will do, Patrick! I’ll make sure to indicate everything we are showing; long stock plus put, bear call spread, a combination of all positions, etc. I thought it would be clear from context but I agree those labels should go in the caption of the graphs as well. Thanks, as I am a newbee and I am a little slow yet. Thanks for all your educational efforts as they make your site worth every penny. Continued good luck. Income Method #8a and #8b involve an Iron Condor play.